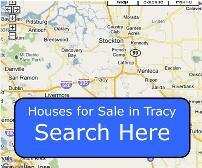 There is a wide selection of houses for sale in Tracy, California. From foreclosures to short sales, starter homes to estates, whatever you are looking for, Gus Saar can help you find it. Call Gus today at 209-740-0767. Located in the Central Valley of California, Tracy is known for several of its events; including the California Dry Bean Festival which features food, entertainment and a car show, the Fourth of July Day-In-the-Park features hot air balloons, arts and crafts and a fireworks display. During the summer the streets are also alive with the weekly farmer’s market. Tracy’s climate is warm during summer when temperatures tend to be in the 80’s and cold during winter when temperatures tend to be in the 40’s. The warmest month of the year is July with an average maximum temperature of 93 °F, while the coldest month of the year is December with an average minimum temperature of 34 °F. The annual average precipitation at Tracy is 10.58 inches . Rainfall is greatest in winter months (between November and March) and very low in summer (between June and August). The wettest month of the year is January with an average rainfall of 1.97 inches . As of the census of 2010, there were 82,082 people, 18,720 households, and 17,947 families residing in the city. The population density was 2,798.6 people per square mile . There were 18,687 housing units at an average density of 868.6/sq miles. There were 17,620 households out of which 51.7% had children under the age of 18 living with them, 65.0% were married couples living together, 10.7% had a female householder with no husband present, and 18.8% were non-families. 14.4% of all households were made up of individuals and 4.9% had someone living alone who was 65 years of age or older. The average household size was 3.21 and the average family size was 3.56. The median income for a household in the city was $62,794, and the median income for a family was $67,464. Males had a median income of $50,095 versus $35,143 for females. The per capita income for the city was $21,397. About 5.2% of families and 7.0% of the population were below the poverty line, including 7.2% of those under age 18 and 10.8% of those age 65 or over. By 2030 Tracy will have 122,790 people and have Employment Projection of 21,996 .